Alabama Bloggers: Support Local Artisan in Nationwide Forbes Contest!!! Support Local Artisan in Nationwide Forbes Contest!!! From the time that I was a little girl and we went to Tannehill State Park to watch her demonstrations, I have always been amazed and in awe of my Aunt Tena Payne's exquisite pottery abilities. 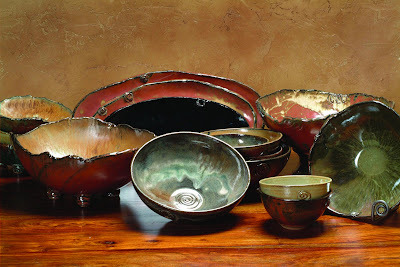 She has taken a hobby that she picked up in High School and turned it into a world class brand of artisan dinnerware, Earthborn Pottery, based in Leeds, Alabama. Her dishes now serve the cuisine of 5-star restaurants, resorts, lodges, and country clubs across the country including Sensi at The Bellagio in Las Vegas, Ozumo in San Francisco, Hot and Hot Fish Club here in Birmingham, Sushi Samba in New York, Chicago, Miami, and Las Vegas, and many others. And now, she is being honored in Forbes Boost Your Business Contest!! One of only 20 finalists nationwide, Tena has an amazing opportunity to win this contest, which would help her grow her Alabama Based business so much further! Please take a second and click on this link and vote for Tena Payne of Earthborn Studios Inc. and help support Alabama Artistry!!! I voted! 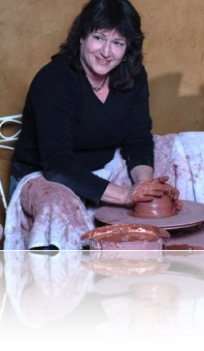 Does she still do the pottery demos at Tanneyhill? I know Tena from our days at Southern Progress. I love her pottery.